On July 9th, the Obama Administration convened a meeting to push forward its agenda to end homelessness. USICH Chair, VA Secretary Eric K. Shinseki, and Vice Chair, HUD Secretary Shaun Donovan, met with other Council leaders including ED Secretary Arne Duncan and DOL Acting Secretary Seth Harris, Chief Executive Officer of the Corporation for National and Community Service Wendy Spencer, Director of the White House Office of Faith-Based and Neighborhood Partnerships Melissa Rogers, and representatives from 11 other member agencies. The group discussed ways to leverage opportunities created by the Affordable Care Act and ways to better serve families who are experiencing homelessness. Donna Seymour, Acting Deputy Assistant Secretary for Warrior Care Policy at the Department of Defense, also updated the Council on DoD’s efforts since the last Council meeting to coordinate transitions from active service to Veteran status for our nation’s Service members . 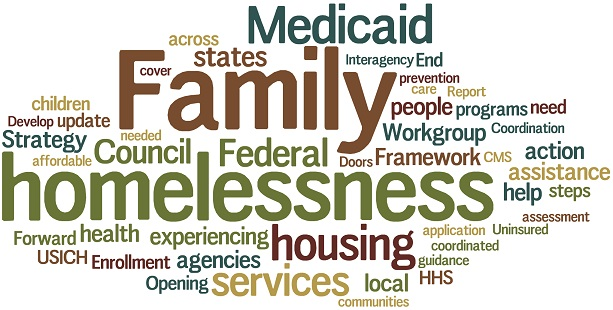 summary of the latest data and suggested Federal strategies that would help drive an end to family homelessness. The presentation prompted an animated discussion among Council leaders. 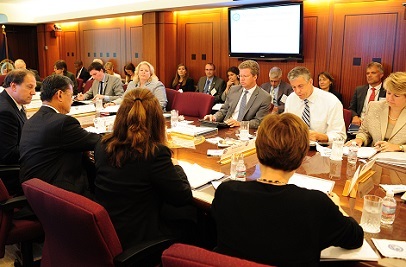 Secretary Duncan highlighted ways the Council’s work on family homelessness aligns with the Administration’s commitment to ensure access to high-quality early childhood education. Secretary Donovan discussed the importance of innovative and cost-effective responses to family homelessness,particularly rapid rehousing. Secretary Shinseki described VA’s commitment of $300 million in grants for the Supportive Services for Veteran Families program. And Wendy Spencer, the CEO of the Corporation for National and Community Service, offered to explore ways that AmeriCorps and Senior Corps volunteers can play an even larger role in helping to end homelessness. With strong leadership from Council Chair Secretary Shinseki and Vice Chair Secretary Donovan and the full support of President Obama and the White House, the Council continues its push to reach the goal of ending homelessness in every community.